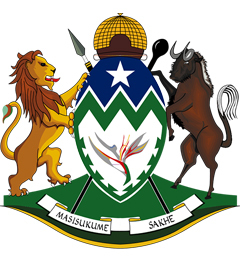 KwaZulu-Natal waited a full decade before adopting a new coat of arms. At the time of writing, the registration process was not yet complete, so the official blazon had not yet been released. The blazon has, however, been prepared in both English and isiZulu – the first time any coat of arms has been officially blazoned in South Africa, in any language besides English and Afrikaans. The province formally came into being on 27 April 1994, when all-race elections were held for the first time in South Africa. Since it was a merger of the former Province of Natal and the non-independent homeland state of KwaZulu, it was named KwaZulu-Natal. It is headed by a Premier, elected by and from the Provincial Legislature, who is assisted by an Executive Council chosen from the Legislature. It was formed out of the former Natal Province and the non-independent homeland state of KwaZulu, plus the part of the Piet Retief district (from Transvaal Province, now in Mpumalanga) that lay to the south of Swaziland, on the banks of the Phongolo River. Alfred (Harding), Babanango, Bergville, Camperdown, Dannhauser, Dundee, Durban, Eshowe, Estcourt, Glencoe, Hlabisa, Inanda, Ingwavuma, Ixopo, Klip River, Kranskop, Lions River, Lower Tugela, Lower Umfolozi, Mahlabatini, Mapumulo, Mooi River, Mpendle, Msinga, Mtonjaneni, Mtunzini, Ndwedwe, Newcastle, New Hanover, Ngotshe, Nkandla, Nongoma, Nqutu, Paulpietersburg, Pietermaritzburg , Pinetown, Polela, Port Shepstone, Richmond, Ubombo, Umbumbulu, Umlazi, Umvoti, Umzinto, Underberg, Utrecht, Vryheid and Weenen. The district in dispute is Mount Currie (or Griqualand East; district seat Kokstad). The retention of this district by Natal, despite the claims of Eastern Cape, mean that the Eastern Cape district of Umzimkhulu is separated from the rest of that province by KwaZulu-Natal territory. The province inherited two capitals: Pietermaritzburg, first established as the capital of the Republiek Natalia, and Ulundi, seat of the KwaZulu legislature. The provincial legislature did not make a decision on which to use until July 2002, when a vote was taken in favour of Pietermaritzburg. KwaZulu-Natal is the only province of South Africa that has grown consistently since 1843, when it (as Natal) was occupied by British forces and had its north-eastern border fixed on the Thukela River (abandoning land as far north as the Black Mfolozi, claimed by the Republiek Natalia). Natal was formally annexed as a district of the Cape Colony in 1844, and also had its southern boundary fixed on the Mzimkhulu River. In 1856 it was separated from the Cape and became a separate colony, and 10 years later it annexed land between the Mzimkhulu and Mtamvuna rivers as Alfred County. In 1897 the Colony of Zululand became part of Natal, bringing with it St Lucia Bay, annexed in 1884, and Kosi Bay, annexed in 1895. In 1903, in response to Natal's claims for war reparations, three districts of the Transvaal Colony (previously Zuid Afrikaansche Republiek) were added to Natal: Utrecht, Vryheid and Paulpietersburg (these last two were what was left of the Nieuwe Republiek). The only time Natal became smaller was during the 1970s, when KwaZulu acquired its own legislature and was effectively (although not formally) separated from the Natal Province. In 1976 Natal received Griqualand East from the Cape Province. In 1994 KwaZulu and Natal were reunited and gained the Phongolo River panhandle from the Transvaal. Since it effectively retained Griqualand East, the province has retained every gain made since 1866. The languages chiefly spoken in KwaZulu-Natal are isiZulu (see Natal Colony for a discussion of this), and English. Afrikaans is a majority language only in the north-westernmost parts of the province. The province's name appears above in all three languages. The word iPhondo (province) is also found in the Xhosa names of the Eastern and Western Cape provinces. The prefix “kwa-”, meaning place or land, is pronounced in isiZulu as “ghwa-”, not “kwa-” as in isiXhosa. None other of South Africa's 11 official languages are spoken by large communities, but there is a substantial minority speaking a variety of Indian languages, descendants of the indentured labourers that entered Natal during the second half of the 19th century (largely from south India) and of the so-called passenger Indians, merchants from northern states, chiefly Gujarat. Zulu is by far the majority language in the province as a whole. There is also a minority of urban Bantu-speakers who use other languages, chiefly isiXhosa-speaking amaMpondo from Transkei. English is spoken by the majority of city dwellers, and by the highest proportion of farmers anywhere in South Africa, especially along the coast and in the Midlands. Most Indians have English as the language they use outside their homes, but their home language often depends on their religion. Christian Indians are largely English-speaking; Hindus speak a variety of Indian languages, but in Natal largely Tamil, and Muslim Indians largely speak Gujarati or English, with Arabic as the language of their religion. The province's population was formerly legally classified according to race: black (literally “Bantu”, covering abeNguni and minority black groups), white and Asiatic (mostly Indians, but including a few Chinese). There is a small Coloured community, except in Griqualand East where there is a large Griqua community (which was classified as a sub-group of Coloured).